Model-View-Controller (MVC) is a software architectural pattern that divides software application into three parts. Model consists of the business logic and functions. View is the representation of the information. These information can be illustrated through graphs or charts or any of the user interface that the user interacts with. Controller receives input from view and model. 2. 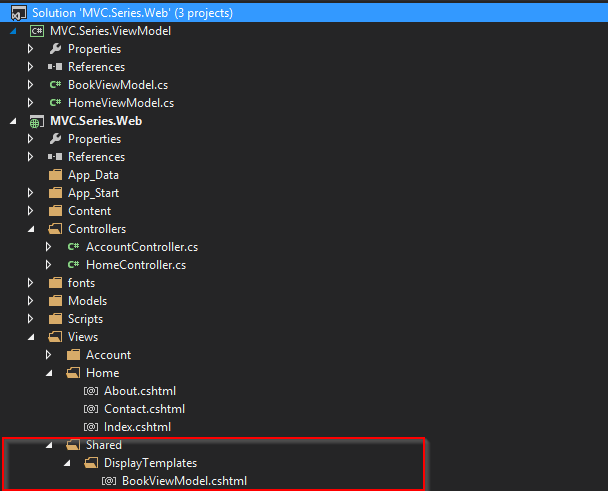 Choose MVC template — this will create a default template with MVC folders. 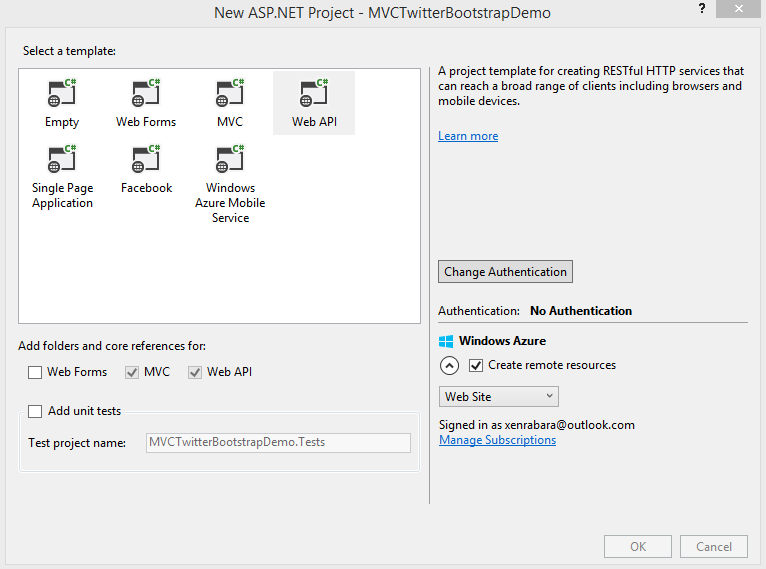 Another template is Web API which will add API folder for REST HTTP calls. 3. Run the app to make sure it’s compiling and building properly. What is Twitter Bootstrap? Twitter Bootstrap is an open-source tool that helps in creating websites or web applications. This tool includes pre-developed HTML and CSS templates for arranging html components (Grid-System), forms, buttons, charts, and other navigation components that we normally see in a responsive web application. Who would not want to see a consistent font and style within a web page? Both developers and users would want to see a consistent flow in a project, so Twitter Bootstrap was built to avoid a confusing layout flow in every web page that users will interact. Whether it is a huge desktop, a really small mobile screen or a phone with a size like a tablet, Twitter Bootstrap got it covered! This tool is developed to have a responsive layout that caters to all the different screen sizes that any user may have. Twitter Bootstrap was made by really great developers who used the latest libraries out there: CSS3, HTML5, JQuery… etc. The CSS was developed using LESS platform that allows using variables, mixins, functions inside the CSS page to make CSS more themable and extendable. 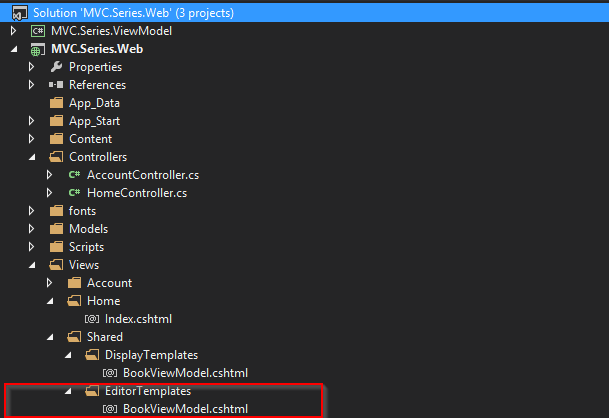 By default, MVC5 is using the Twitter Bootstrap template by default. That means, the bootstrap.min.js and bootstrap.min.css are already inside the project and we do not need to download it from Twitter Bootstrap’s webpage to use it’s styles. Twitter Bootstrap’s grid system scales up to 12 columns. This means that all the columns with .col-md-* should add up 12. Any columns after the 12th will be stacked underneath the first 12. Rows are placed inside a class .container for proper alignment. Use class .row to create horizontal column groups. NOTE: As the browser widens, the smaller-sized classes gets overwritten. As the browser contracts, the larger classes are overwritten. To move columns to the right, use “.col-*-offset-*”. The first * depends on the screen size which could be written as “.col-xs-offset-, .col-md-offset-, or .col-sm-offset-“. The second * increases the left margin of column by * columns. For example, “.col-md-offset-4″ moves that column over four columns. As we can see on this example, we could combine the class names “.col-md-4″ and “.col-md-offset-3″ which defines the width of the column then offsets the column to 3 columns (-offset-3). Like the grid system example, the offsets follow the 12-column way of how the columns are arranged. An example would be doing “.col-md-4″ followed by a div with “.col-md-4 .col-md-offset-4″. Where will the second div be? So, since the position of the second div (without the -offset-4) is beside the first div, the offset made it so it moved another 4 columns over. For this example, the parent row (with a class .col-md-9) has a 9 column-width. Since the next row is nested (with 2 .col-md-6) that add up to 12-columns, their TOTAL WIDTH will only extend up to 9 columns (not 12), but they will be evenly divided because both of them add up to 12 columns. IMPORTANT: Nested rows (even when the column-set adds up to 12 columns) follow the max width of the parent row unlike a non-nested row that can span out to 12-column width. We use the modifiers .col-md-push-* and .col-md-pull-* to change the order of the grid columns. For this example, we can see that we pushed the 1st column to 3 columns to the right and pulled the 2nd column 9 columns to the left. Since the columns are also 9 and 3 column-width respectively, they just switched places. IMPORTANT: In other words, we use -push- and -pull- to re-organize our column positions. Unlike offsets, when we “push” a column, it does not affect the position of any other column beside it. For example, if there are 2 columns, and only the first column has a “-push-*” class, the 2nd column will stay in the same place and will not be pushed to the right. Offset, on the other hand, pushes everything to the right of the column that has the -offset-* class.